CHESHIRE, Conn. – The CIAC is providing information for media coverage of the 2017 CIAC spring sports championships as the tournaments progress. There will be no credentialing process for tournament games in any sports prior to the finals, media can use identification they’ve used during the regular season. Media are encouraged to contact host sites in advance of the game to communicate accommodation needs. The online credential applications for the CIAC finals in baseball, softball, boys lacrosse, girls lacrosse, and boys volleyball will be posted on CIACsports.com on Monday, June 5 and will be updated throughout the week as finals match-ups are determined. Barring schedule changes due to weather the application deadline for boys volleyball will be Thursday June 8 at 9 a.m. and for all other sports will be June 8 at 5 p.m. Updates to the deadlines will be noted on CIACsports.com and in the application. The NFHS Network holds the exclusive streaming and broadcast rights for the CIAC tournament games. 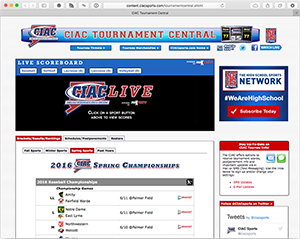 Those planning to provide broadcast of CIAC Tournament games must complete the CIAC Broadcast Application which is available here: http://casci.ac/1491 and pay the rights fee associated with those broadcasts in addition to submitting the online credential request to insure the game is available for broadcast by another entity. The game schedule and times for the tournament finals in the previously-mentioned sports will be determined after the conclusion of the semifinals and posted on http://tournamentcentral.ciacsports.com.